Kabul Municipality has basically started construction of streets and roads since 1395 solar year, and a number of projects which were not completed in 1396, would be wrapped up this year. Kabul Municipality Spokesperson and Head of Publication Affairs, Abdul Jalil Sultani told The Kabul Times according to a survey launched by Kabul Municipality in 1395, we found out there are almost 3200 km roads in Kabul, 52 percent of which had already been constructed, 22 percent of them needed reconstruction and 26 percent of them have been ruined. He added 48 percent of Kabul city roads needed reconstruction. “Kabul Municipality has arranged a three-year plan (1396-1398) for 48 percent of roads that were almost 1700 km. Fortunately, over 300 km roads have been completed in 1396 and currently, work is ongoing on a number of roads to be wrapped up by 1397 and the rest would be included in 1398 fiscal year budget,” he went on to say. 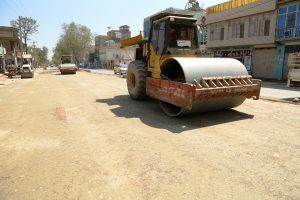 He said Kabul municipality has begun construction of a road in Parwan-e-si, Tanzif square, Labi Jar-Panjsad Family road and first part of Khair Khana, that are ready to asphalt and would be utilized until one and half a month. Likewise, he said there was a big canal in Wazir Abad that has been designed by an international company in 1396 and currently, its construction is ongoing. About Kabul Municipality problems, Sultani said each city had its problems and our main problem is the properties’ acquisition, adding when we are working on an uplift project and have to cross a road from an area, we face reaction of our citizens, a move causes the projects to be postponed for months. He added we ask our countrymen to cooperate with the municipality, because we don’t recklessly apply the projects. Besides we have some problems with private sector that contract the projects, he said, adding unfortunately, majority of them are not capable to complete the works on time, an action which has turned into a great challenge to Kabul Municipality. At the end, he said, Kabul Municipality is making effort to implement and complete all uplift projects such as construction of roads, social places and recreational sites, therefore we ask our countrymen to cooperate with us in this respect.